Jacolette: | a gallery of Irish snapshot and vernacular photography. I have been guilty of neglecting this blog over the last year mainly due to finishing my PhD. I’m getting back to it now with this image of Ormond Quay Upper, Dublin. It dates from early 1920 or 1921 when the quays were still cobbled and had two-way traffic. Young children, some shoeless, follow a military band and marching ‘soldiers.’ These are most likely auxiliaries who formed a paramilitary unit of the Royal Irish Constabulary. Set up during the Irish War of Independence, they were infamous for their reprisals against the civilian population and were generally disliked. Passengers on the upper deck of the open-topped No. 24 tram lean out to watch them pass. The tram followed a route from Parkgate Street to O’Connell Street. During this period, the Dublin tram system was extensive and by 1911 there were 330 trams criss-crossing the city. The 24 route was first established in 1874 and it closed in 1938. Capel Street bridge is visible in the distance and it is also possible to make out the sign on No. 20 which was a temporary branch of Bank of Ireland. A new Ormond Quay branch of the bank was built further along the quays. The architects were Millar & Symes. No. 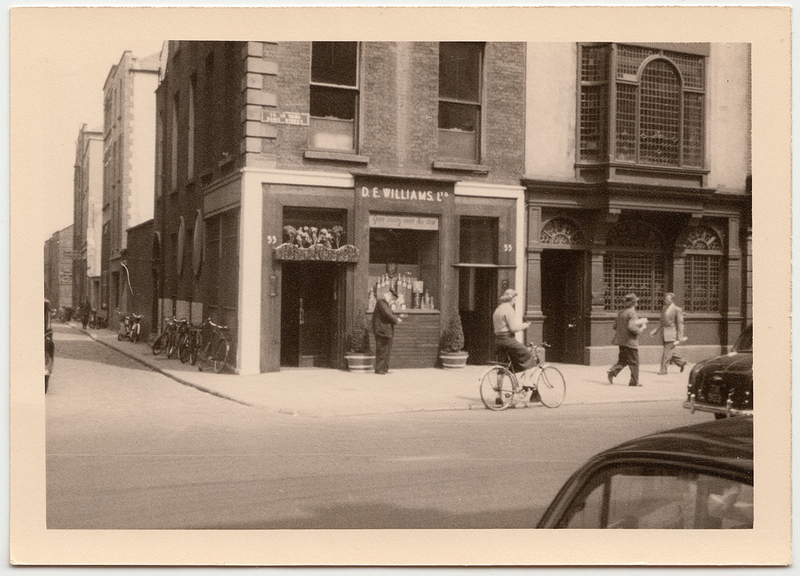 18 Upper Ormond Quay housed Watts Brothers gunsmiths from 1969 to 1999. In 1920 is was a hotel and restaurant and it is currently undergoing restoration by the Dublin Civic Trust. I was also delighted to see that another building on this block is being restored by Sunni L. Goodson and you can find an account of her work on the building here. The photographer David Jazay took some great images of the quays before many of the original buildings were demolished. You can see his work here. Whilst researching this photograph I came across an amazing photograph taken along the same quays ca. in 1900. It shows Roche’s hairdressers at No. 31. It is a beautiful shop front with interesting signwriting. Hairpieces hang in the window. The business was founded in 1889 by Lucinda (Lucy) Roche (nee Byrne). The little boy in the sailor suit is Sean Roche who went on to fight in the 1916 Rising. Thanks to Ciaran Clarke, for permission to re-post the photo. Ciaran is a descendant of Lucy’s and the 5th generation of the family to work in the business. He runs two barbershops in Kildare and you can find out more about the history of the family business here. Thanks also to my colleague Lar Joye for identifying the unit as auxiliaries. This series of portraits shows members of the rural vocational organisation Muintir na Tíre (People of the Land). Established in 1937, it aimed to counter societal breakdown in rural Ireland. It followed the teaching of the Catholic Church’s encyclical Quadragesimo Anno which hoped to challenge the threat of communism through strong lay and vocational organisation. Eoin Devereux’s 1991 article on Muintir na Tíre noted that it reflected the strong anti-urbanism which prevailed in Ireland during the period and that persists in certain quarters to this day. The following quotation from the organisation’s 1941 handbook is very revealing: “Country life is not dull. It is the city life that is cheerless and stupid and vapid, degenerate, futile and foreign with its narrow conventions, its artificiality and its purchased amusements.” Despite the organisation’s antagonism towards the urban, Devereux notes that many of its leaders were urban-based professionals. This accords with the location of the photographer’s studio. J. Dunne worked from 36 Leinster Road in Rathmines, a suburb of Dublin. These portraits are more informal than official passport photographs and more revealing of the sitters’ personalities. From a sartorial point of view their clothes are typical of the 1950s as tweeds and woollens dominate. Tank tops, wide neck ties, thickly framed horn-rimmed glasses were popular with the men. Some wear the pin of the Pioneer Total Abstinence Association of the Sacred Heart (PTAA), an Irish organisation for Catholic teetotallers. There is more variety in the women’s outfits. One wears a fitted dress with a fur-ruffled collar while another has a broad-shouldered fake fur coat. Tweed is also popular with the ladies as were knitted tops and twin sets. These are adorned with pearls, brooches and lace collars. All wear badges with the organisation’s logo featuring a cross superimposed on a plough, thus linking the rural and the religious. The portraits were most likely taken at a function room or in Dunne’s studio in suburban Rathmines where he operated for a short while from 1954. The series is interesting in that it shows a certain cohort of middle-class, respectable, Irish people of a variety of ages. These portraits were instigated, not by the usual familial ties which cause a visit to the photographic studio, but rather by membership of a vocational organisation. Further reading: Eoin Devereux, ‘Saving rural Ireland – Muintir na Tíre and its Anti-Urbanism, 1931-1958’ in The Canadian Journal of Irish Studies, 17, 2 (December 1991): 23-40. Maurice Curtis, A Challenge to Democracy: Militant Catholicism in Modern Ireland. Dublin: The History Press Ireland, 2010. Maurice Curtis, “Miraculous Meddlers: The Catholic Action Movement.” History Ireland 18, 5 (2010): 34-37. 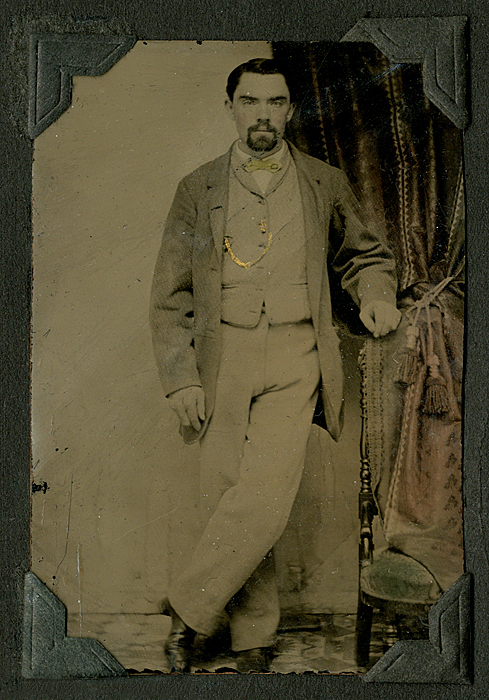 This carte-de-visite was taken at Thomas Whittaker’s Dublin Metropolitan Photographic Company in or around 1860. It doesn’t give an address, however, Edward Chandler’s inventory of nineteenth century Irish photographers lists the company as operating ca. 1860 in both Kilkenny and Dublin. It appears that in the capital, Whittaker worked out of 140 Stephen’s Green West and from another address on Grafton Street. Whilst his Kilkenny base was on John Street. According to a discussion on an Irish genealogical site, Whittaker died in 1872 and I think I have located his son’s family on the 1901 census. I’m basing my date of ca. 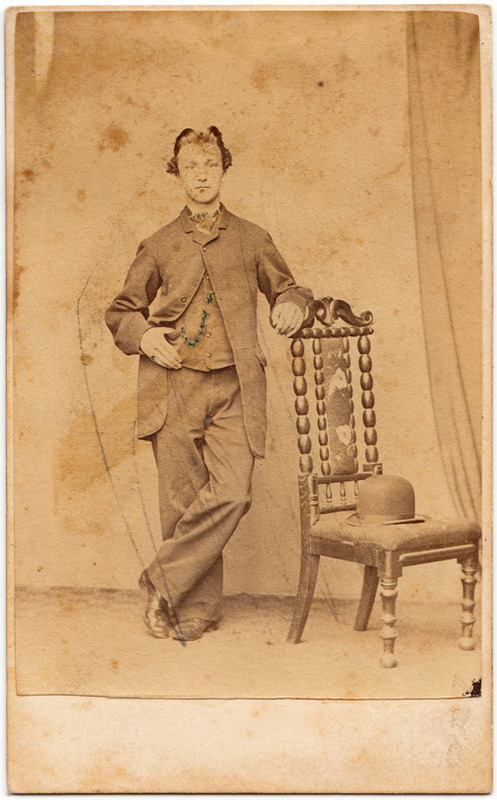 1860 on both the fashions and the type of card mount that was used. 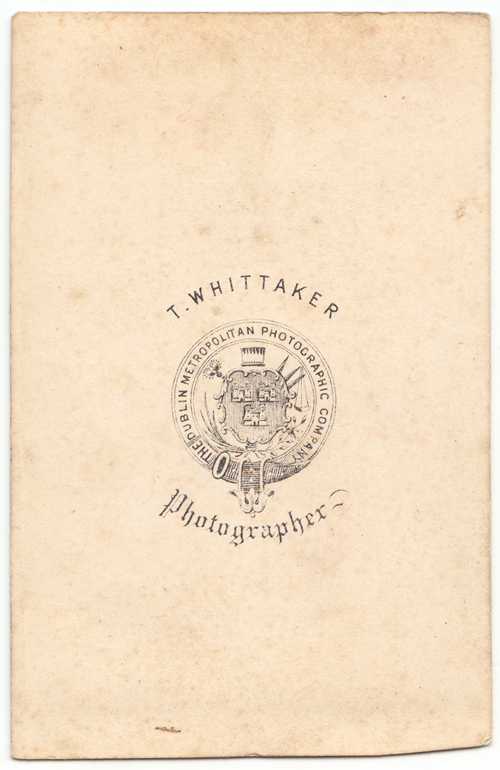 Early 1860s cartes had square rather than rounded corners and the photographer’s name and/or crest were printed in the middle of the card. Whittaker’s crest has enclosed the Dublin City Coat of Arms within a strap and buckle design. 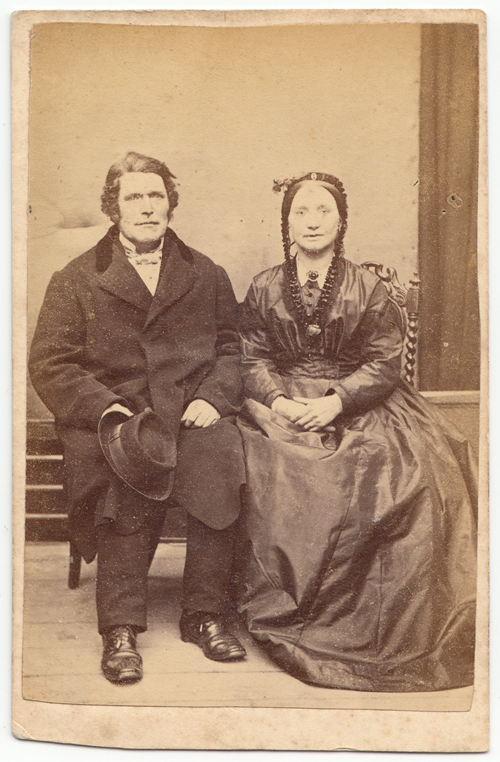 The fashions worn by the couple are typical of those between 1860 and 1865. She wears a crinoline and the voluminous silk skirt spreads out over the chair and onto the floor. The buttons on her bodice and the brooch pinned to her white collar are made of ebony or vulcanite. The bodice appears to be lightly pleated and gathered and is finished with simple coat sleeves. 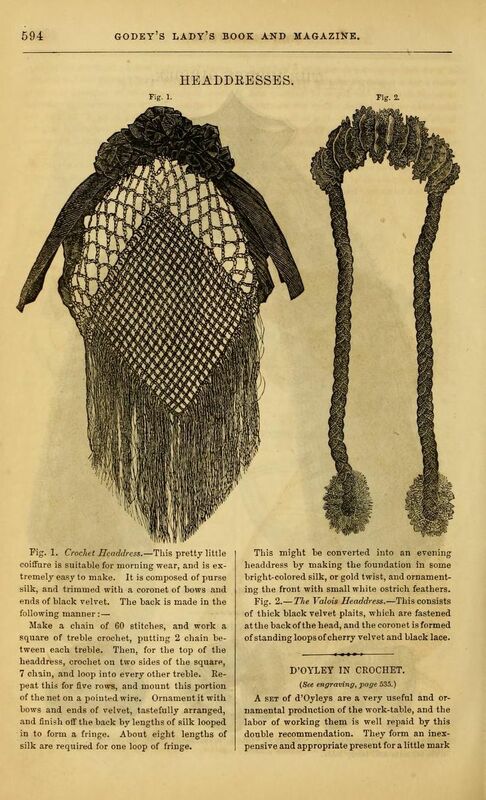 Her headdress which consists of two plaits is very similar to the one below which was featured in Godey’s Lady’s Book in 1862 (source archive.org). The man wears a large loose fitting wool overcoat with wide notched lapels and a contrasting velvet collar. His upturned shirt collar is finished with a loose bow tie. He carries a hat with a wide band, turned-up brim and a telescope style crown. His trousers are wide legged and his laced shoes appear to be well-worn and polished. Together this middle-aged couple are keeping up with the styles of the 1860s. This is the fourth year that I’ve written about the photographic references within Joyce’s Ulysses. Episode 14, Oxen in the Sun, relates to pregnancy and birth and includes a reference to ‘artistic coloured photographs of prize babies’ whose circulation to pregnant women was recommended. 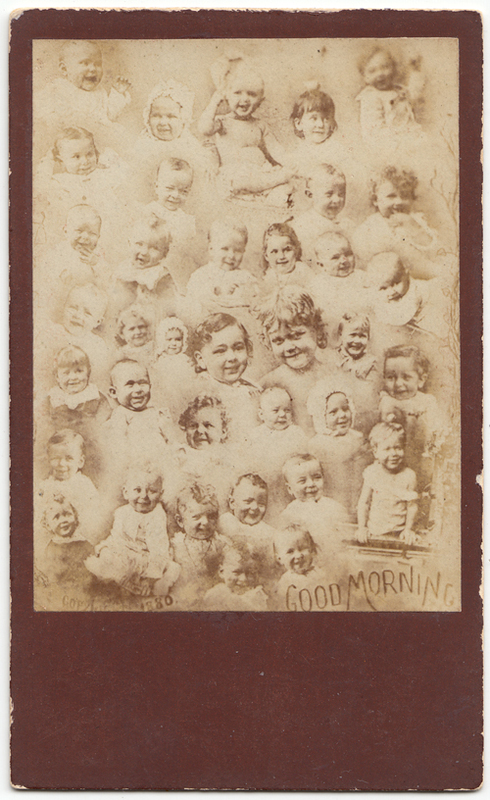 The carte-de-viste below dates to 1880 and is a composite image of thirty-seven smiling babies hovering over the phrase ‘Good Morning.’ Joyce refers to a coloured photograph and curiously page 45 of James Birch’s Babylon: Surreal Babies (Dewi Lewis, 2010) includes the same image reproduced in a pastel tinted postcard printed in Germany and sent from France ca. 1900. In Episode 17, Ithaca, Bloom’s mental inventory of the contents of a cabinet at his home 7 Eccles Street includes ‘fading photographs of Queen Alexandra of England and of Maud Branscombe, actress and professional beauty.’ I’ve featured Maud on a previous Bloomsday post here, however, the photo below shows the Queen whilst she was Princess of Wales and which was taken in 1863 not long after her marriage to Edward the VII. 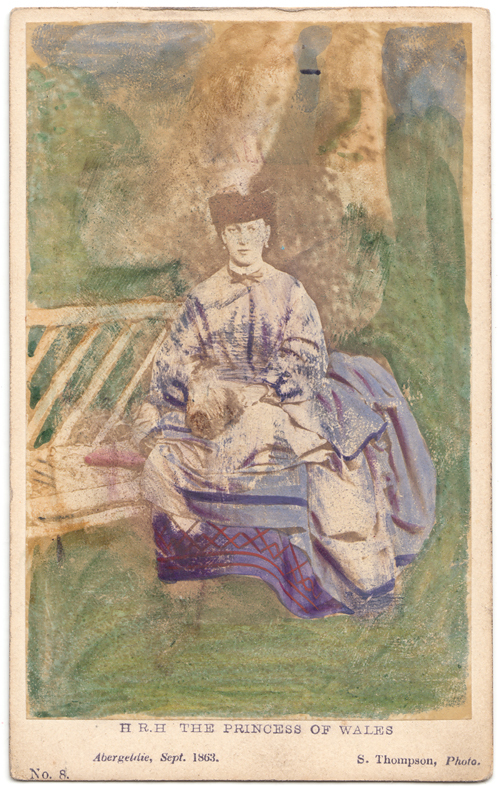 It is hand-tinted and in the carte-de-visite process. Images of Alexandra sold very well throughout her life and she visited Ireland on several occasions. 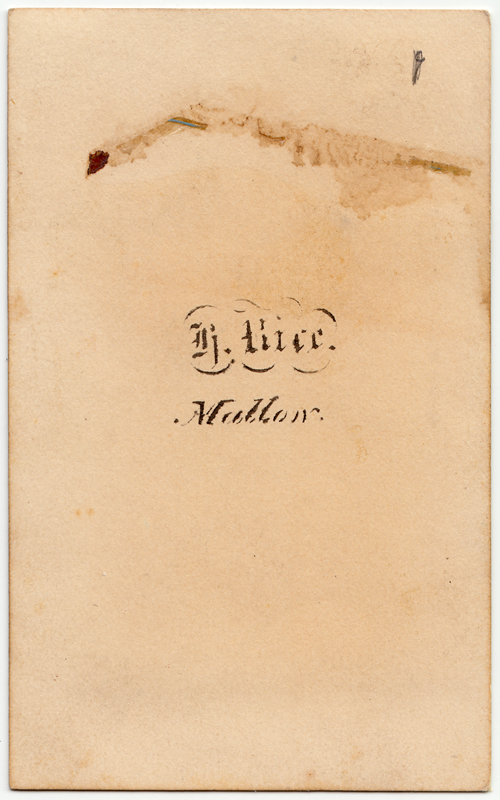 Other Ulysses related posts include ‘Milly Bloom and Photography’ and ‘Grandpapa Giltrap’s lovely-dog‘.